Best Mattress for Side Sleepers: Which is Best? In deciding on the best mattress to buy, it’s important to consider sensitive pressure points and natural spine alignment, along with the natural curves of the body. After all, these are the things that will cause discomfort if not properly addressed. There are, of course, beds that are completely wrong for side sleepers and should be avoided for those who prefer this position. Here, we will discuss which mattresses make the worst and best choices for side sleepers along with the health benefits of side sleeping and tips for getting the best sleep possible as a side sleeper. The Amerisleep AS3 has the perfect balance of softness and support, so you feel like you’re “in” the mattress without getting “stuck. The AS3 uses Amerisleep’s HIVE® layer to provide targeted pressure relief, which reduces pain-causing pressure points by 49%1. Plus Amerisleep’s Bio-Pur® material has an advanced open-cell structure. It bounces back 10 times faster than standard memory foam and is five times more breathable to keep you cool. And like all Amerisleep mattresses, the AS3 comes with a risk-free, 100-night sleep trial and a 20-year warranty. 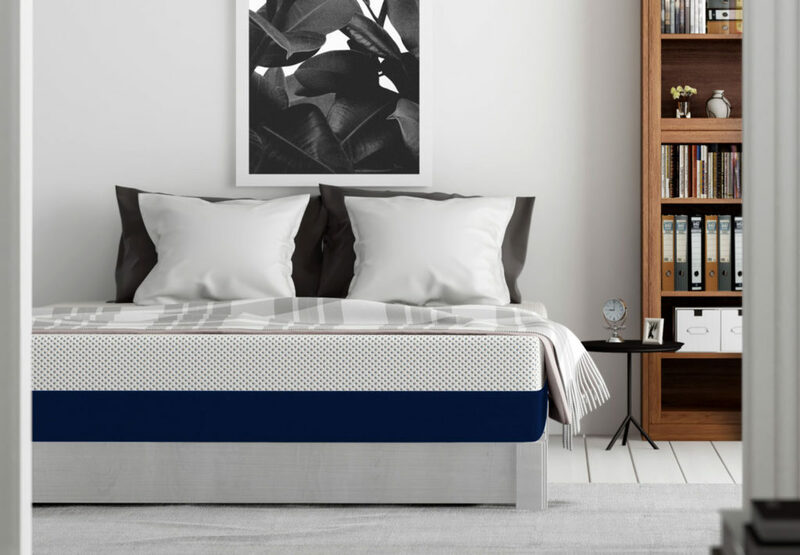 This hybrid mattress combines a memory foam comfort layer with an innerspring base layer. Some sleepers enjoy the movement isolation offered by the individually wrapped coils, and the cushioning afforded by the thin layer of memory foam. Customers receive a 120-night trial period and a 15-year warranty. Should I Sleep on the Left or the Right? What Should I Do with My Arm? The absolute best mattress for side sleepers is either a latex or memory foam mattress. Sleeping in this position places your body’s weight on the hips and shoulders. With innersprings, this distorts the natural curve of the spine and creates more pressure points that need to be addressed. Therefore, side sleepers should sleep on a bed that is slightly softer and designed to relieve pressure points. A more cushioned mattress curves to the shape of the body but also needs to provide adequate support, which is what makes foam-type mattresses a great choice. Latex and memory foam are great options because they support the natural curve of the body when sleepers lie down on the bed. Memory foam is specifically designed to cradle each point of the body it comes into contact with while distributing weight and pressure evenly across the surface. Extra support for areas such as the shoulders and hips is especially critical because it is these areas that are most strained in this position. In these mattresses, the hips and shoulders are allowed to rest in a natural position rather than being pushed up by springs. According to Allure, this is the best mattress you can buy online. It’s classified as a medium mattress: it has the perfect balance of softness and support. And because this mattress has additional, targeted pressure relief, you feel more like you’re “in” the mattress — without getting “stuck”. With over 14,000 user reviews, Amerisleep’s products have a 4.7-star rating (out of 5 stars). Also, Amerisleep offers customers a 100-night sleep trial and a 20-year warranty on all mattresses. Maybe you’re an occasional side sleeper and don’t stick to just one position. If so, this is a great option for you. It’s the most versatile mattress in this collection, so it can easily adapt to a range of positions. When you’re sleeping on it, it feels like you’re floating. That’s because of the Bio-Pur™ and HIVE® layers. Amerisleep’s Bio-Pur® material has an advanced open-cell structure that makes it five times more breathable than normal memory foam. This creates a responsive, soft feel that relieves your main pressure points. It has all this plus the cherry on top: the Celliant® cover that turns body heat into infrared energy. With a soft and responsive HIVE® layer that reacts to your body position, it can evenly support your weight and relieve pressure points. It makes you feel like you’re as light as a feather. This may be the best mattress for lower back pain sufferers. Thanks to the Bio-Core™ layer, this mattress won’t sag even after you’ve slept on it for decades. Plus, it’s eco-friendly! The Bio-Pur™ foam is partially made from plant materials instead of petroleum, and it ships in an eco-friendly box. This is a unique combination of materials and construction that you are unlikely to find in many mattresses. Some sleepers enjoy the movement isolation offered by the individually wrapped coils, and the cushioning afforded by the thin layer of memory foam. Customers receive a 120-night trial period and a 15-year warranty. Unfortunately, this is not the right mattress for those who enjoy the memory foam experience. Memory foam makes up a small percentage of this mattress. Additionally, some sleepers complain that they felt too hot during the night when they slept on the Saatva. The steel coil foundation is also worrying. 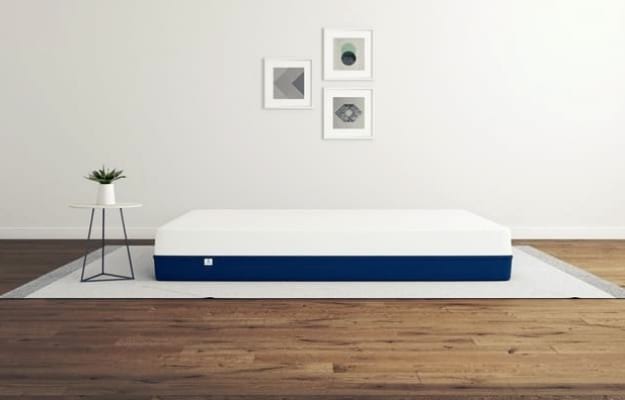 Since it has a steel coil base, it runs the risk of losing its firmness over time compared to a memory foam mattress. The LUCID 12-inch memory foam mattress has a 3&dquote; gel ventilated memory foam layer, a 1’’ bamboo charcoal layer, and an 8’’ supportive base. While the gel memory foam helps provide a slightly cooler sleeping experience compared to traditional memory foam mattresses, it’s still a little too hot for some. This medium-firm mattress comes with a 25-year warranty and a 30-day trial period. Some customers have complained that the mattress can be too heavy. Since you are responsible for setting up the mattress yourself, this could be an issue. Reviewers have also commented that the mattress was much firmer than they expected. If you prefer a soft, plush top layer, consider choosing a different mattress. Many reviewers have said the cover is difficult to remove and permanent depressions set in around five years after purchase. The shorter trial period is also discouraging. Sometimes, before deciding if it’s the right mattress for you, you need to spend at least 30 days sleeping on it. We recommend choosing a mattress with a lengthy trial period before making a final decision. The other two mattresses on the list offer much more accommodating trial periods. Overall, The Best Mattress recommends the Amerisleep AS3 as the best bed for side sleepers. It keeps you cool and offers unparalleled comfort. Its warranty beats the Saatva, and its trial period beats the LUCID mattresses. Many people may have heard a firm mattress is better for support. This is simply not true for side sleepers. Back sleepers benefit more from a firm mattress because their body is evenly distributed across the bed. When it comes to side sleepers, it’s a different story. Side sleepers often feel the most pressure in the hips and shoulders, a fairly small surface area. Most side sleepers of an average size prefer soft to medium firmness. If side sleepers experience pain in this area, it’s likely their pillow may be too low or the mattress causing shoulder pain. Another myth is side sleepers should sleep on an extremely soft mattress. This is not true either. If the bed is too soft, then it provides absolutely no support. The body is instead subjected to an awkward slumping position that causes aches and pains. This is why side sleepers benefit most when their mattress takes the best of both worlds. Specifically, the ideal bed for side sleepers to have is a medium mattress. This type of structure provides the best mattress support to reduce pressure points and also cradles the curves of the body as you sleep on your side. There are a number of beds side sleepers should avoid. Waterbeds and innerspring mattresses do not provide the proper support side sleepers need. In short, any bed that contorts the body and provides too much stiffness or too much slump will cause side sleepers to have stiff muscles, back and joint pain, and a restless night’s sleep. Innerspring mattresses can cause uncomfortable support because the springs are not evenly holding up the body. They push up on the heaviest parts and don’t support the lumbar region. Not only is this improper support, but it also causes strain on the mattress springs. Likewise, traditional waterbeds provide inadequate support since they don’t distribute weight evenly and may create a “hammocking” effect. A waterbed may be the worst type of bed for side sleepers due to its lack of firm support. Instead, side sleepers should consider latex or memory foam mattresses. Lots of side sleepers prefer memory foam mattresses. The right kind of foam mattress can provide the mix of support and cushion needed to minimize your pressure points, align your spine, and give you an overall solid night’s sleep. Since there are all kinds of latex and foam mattresses on the market, here’s a quick overview of the best types for side sleepers. Latex is a popular choice for many side sleepers. It has an ideal mix of support and cushioning to be both comfortable and supportive in regard to keeping your body properly aligned. It can also provide a cool (temperature-wise) experience for side sleepers. They hold their shape for a long time, too. 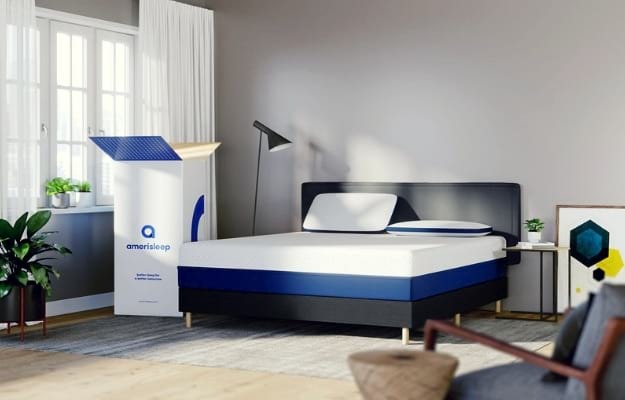 Customizable hybrid mattresses are a fairly new option that could be a boon to side sleepers, especially if they are sharing a bed. With customizable options, these mattresses are formulated to specifically fit a sleeper’s body and preferences. What’s more, some brands let you customize each side of the bed differently, meaning couples wouldn’t need to compromise on a mattress that doesn’t fit one of them. Plant-based memory foam can also provide an excellent night’s sleep to the side sleepers out there. These mattresses have a portion of their materials coming from plant-based sources. This is perfect for the side sleeper who wants to promote safe and environment-conscious choices. Many plant-based mattresses also offer extra cooling qualities. If you tend to sweat or get overly hot in your sleep, a gel-infused memory foam mattress may be a good fit for you. These mattresses were designed to lower the heat of the mattress by increasing the amount of airflow. Some sleepers are discouraged by the idea of memory foam mattresses because they get too hot during the night. Fortunately, advancements like new gel memory foam mattresses create cooler, more comfortable beds for side sleepers. This is another area where the AS3 from Amerisleep excels. It improves upon standard memory foam by using Bio-Pur®. Bio-Pur® is five times more breathable and 10 times more responsive than typical memory foam, effectively solving the two most common problems sleepers have with memory foam (lack of breathability/overheating and slow response time). The Amerisleep models also offer a revolutionary HIVE® (Harnessing Intelligent Ventilation & Energy) layer too. This is what sets Amerisleep apart from the competition. In clinical tests, HIVE® reduced pressure points by an astonishing 49 percent. The combination of HIVE® and Bio-Pur™ offers a completely new experience that you can’t find in other memory foam mattresses. Sleep is one of the most important parts of our lives. During sleep, our body processes memories, releases hormones, eliminates useless information, and relaxes our muscles. The sleep we get affects our entire day, influencing our mood, focus, and hunger. This, in turn, affects our weight and diet. The position we sleep in can make or break the overall quality of our sleep. It has a significant impact on how we carry ourselves in our waking hours. Some side sleepers find this is an ideal position for eliminating back pain. This is also a smarter choice for your spine and hips. If you sleep with your head, heart, and spine all in alignment, this promotes healthier joints and muscles. Do your research to make sure you have the best mattress for sleeping on your side back pain. You also have to make sure you are sleeping in the correct position. There are a few different ways to sleep on your side. It’s very common for side sleepers to slip into the fetal position at some point during the night, but it’s much better overall if you can keep your body in a straight line. This should help reduce your back pain. Sleeping on your side may assist with improving your heart health. Gravity can guide drainage from the lymph nodes toward the heart and drive aortic circulation away from the heart. When your head, feet, and heart are all aligned, you are promoting strong blood circulation throughout your entire body. Much to the delight of people who sleep in the same room as snorers, the position you sleep in can actually make a big difference. Some doctors have recommended people sleep on their side if they suffer from chronic snoring or sleep apnea. When you sleep on your back, your tongue is more likely to block and constrict your breathing. It creates the strained sound of snoring. Sleeping on your side keeps your airway more open and clear so you can breathe easier, thus reducing the volume of the snores. This works best if you keep your body straight than in a bent fetal position. Every sleeper is different, and some may find it better to sleep on one side than the other. Researching which side is better for you often bring conflicting results. However, Dr. Matthew Hedlund, director of the Center for Circadian Medicine, says that sleeping on your right side could help your cardiovascular health. “Sleeping on the right side, by having the heart fall in that direction rather than where it sits on the left, may slightly improve heart dynamics,” he says. Based on these reports, we recommend sleeping on your right side as the healthiest option for side sleepers. Besides choosing the best bed for side sleepers, you need to pick the right pillows. Side sleepers should get a pillow that is both firm and thick. One of the most common ailments faced by those who sleep on their sides is waking up with a sore neck. However, this can be easily fixed by choosing the right-sized pillow. Ideally, your spine should stay straight when you’re sleeping. This means you need something that can fill the space created by your shoulders between your head and the mattress. You don’t want to crane your neck at an odd angle when you’re sleeping. If your pillow is either too full or too flat, this could create an excess of pressure on your upper spine, neck, and shoulders. When your spine isn’t supported correctly, it can cause compressed or pinched nerves. Many side sleepers don’t choose the right pillow and, as a result, they wake up with a stiff neck. This can be easily remedied by putting the correct amount of distance between your head and the mattress. Ideally, your pillow should position your head directly centered between your shoulders when you’re sleeping on your side. The Comfort Classic memory foam pillow by Amerisleep is an excellent choice for side sleepers. Complete with precision cooling channels and a breathable bamboo cover, this pillow wicks away heat and moisture so you can have a comfortable night’s sleep. In fact, this pillow was designed to be used by either back sleepers or side sleepers, and it pairs well with an Amerisleep mattress. It’s also naturally antimicrobial and hypoallergenic. Choosing the right sleeping position and mattress are only two components of making your sleep the best it can be. Get the whole package by making sure you have the ideal pillow for your preferred position. If you’re a side sleeper, this can be one of the most frustrating things when trying to find a comfortable position: figuring out where to hold your arm when sleeping. One common position involves folding up your arm underneath your head but be warned this can cause problems. By bending your neck against the alignment of the spine, you are potentially causing pain to your back and neck. It is recommended that you don’t sleep on your arm. If you do sleep on your arm, you risk getting the unfortunate “dead hand” or “dead arm” feeling. This happens because you have restricted blood flow to your arm. It could also be a factor if your shoulders are stiff in the mornings. Try to sleep with your arms either at your sides or in front of you. This should minimize discomfort for your arms. Looking to get better sleep as a side sleeper or curious about how you can switch to side sleeping? We’ve got you covered. Here are some ways to make sure you’re getting the best night’s possible sleep as a side sleeper. Give your body a good stretch as soon as you wake up. Since you might end up in the fetal position at some point during the night, it can help immensely if you bend your torso the opposite way to offset any potential soreness. Some studies estimate 41% of sleepers go with the fetal position. Those individuals could benefit by having a good stretch first thing in the morning. Also, try placing a pillow between your knees while you sleep. This can relieve some pressure on your lower back and hips and allow for a straighter spine. It is recommended you use a thin pillow between your knees. A thick one would create too much imbalance. Keep your head centered between your shoulders. Don’t point your head either toward or away from your pillow. You also want to keep your upper body straight. If you twist your upper body, you risk putting undue strain on your spine and back. Although side sleeping is recommended, sleeping on your side may not come naturally. If you need help adjusting to your side, there are a few methods you can take to ease the transition. Try putting a body pillow against your back to keep you from turning around. If you’re having trouble sleeping on your side, find a way to relax before going to bed. This could include journaling, aromatherapy, meditation, or reading a book. Try to avoid screen time before falling asleep. This can have negative effects on your sleeping patterns. Switching your default sleeping position may sound challenging – not unlike going from right- to left-handed. However, if you are trying to switch from being a stomach sleeper or back sleeper to a side sleeper, there are some easy ways you can make the transition easier. You can try adding a pillow under your armpit. Stomach sleeping is considered one of the unhealthiest sleeping positions, so this is a great stepping stone toward healthier sleep patterns. You’re replicating the feeling of sleeping on your stomach while reaping all the benefits of sleeping on your side. Stomach sleepers looking to become side sleepers could be doing themselves a huge favor. When you sleep on your stomach, you put a lot of pressure on your neck and back, which can cause long-term problems. It can also worsen your quality of sleep. If you find yourself waking up multiple times during the night as a stomach sleeper, consider converting to a different sleeping position so you can sleep through the night. To become even more proficient at side sleeping, try sleeping on a small couch for a short amount of time. The narrower it is, the better. By limiting your space, you force yourself to adapt to a new sleeping position. Even better, once you master the ability of side sleeping, you’ll be better able to fall asleep on couches and other spaces when you don’t have access to your trusty bed. Another slightly more unconventional method involves sewing a tennis ball into the front or back of one of your sleeping shirts. This may sound odd, but there is a good reason for doing this if you’re trying to convert to side sleeping. With the ball on either your chest or back, it will create discomfort if you try to move outside of the side sleeping position. Eventually, you will have trained yourself to stay in a sideways-facing direction. The major factors a mattress for side sleepers must address are support and also cushion. The cushion is important because of the vulnerability of pressure points in this position. However, support must also be a priority because this position also makes people more susceptible to shoulder and hip pain if there is not enough firmness in the mattress to hold up the body evenly. The ideal mattress for side sleepers takes both of these factors into account. That’s why we recommend the Amerisleep AS3 as the best mattress for side sleepers with shoulder pain, which offers a medium firmness level to accommodate side sleepers and anyone transitioning from their current back or stomach sleeping habits to sleeping on their side. If you sleep in a particular way like a lot of people, it’s important to find a bed you can use comfortably. Doing research to find the best mattress for sleeping on your side, in particular, needs some special consideration. At the end of the day, it’s still your comfort that matters. It’s up to you which mattress best addresses your needs as a side sleeper. Do you have more questions about what we recommend here? Let us know in the comments section below! I am/was a side sleeper. I spent $3,000.00 on a Serta iComfort about 5 years ago. I have residual aches and pains from a couple of car accidents. The icomfort has never been a miraculous solution to my pain. However during the past 12 to 24 months the pain I suffer from sleeping on the icomfort mattress has become unbearable. I suffer bilateral shoulder point pain, bilateral collar bone pain at both ends of those bones. I suffer bilateral hip pressure point tenderness and lumbar pain. It takes about an hour for the pain to subside after I get out of bed. The sleep I get is unrestful. I stopped sleeping in my icomfort bed because I could no longer stand the pain. Since December I have been sleeping in my Lazy-boy chair instead of suffering through the night in the icomfort bed. My wife is very angry that I don’t come up to our bed however the pain of sleeping in the icomfort bed is worse than my wife’s anger because I don’t sleep with her. Does anyone have any helpful suggestions. Can any one tell me if foam mattresses cause o erheating throughout the night? It depends if it is open cell foam, or closed cell. Open will cool. Closed not so much. Thank you for the article. Can you recommend some foam and or latex mattresses that I can start my search with for a side sleeper? I am starting my search this weekend and I guess I will be spending some time laying around the stores. I am determined not to purchase without serious research as this will probably by my last high dollar mattress purchase of my life and I am determined that it will be right the first time. Thank you in advance. When I spend night at my beau’s house, my shoulder hurts In the morning. We are both side sleepers. I have found that pure foam makes my hip points hurt.. I am looking at Sears leola … 850 springs + foam….. but am shopping around still trying to learn.. I gave slept so well at hotels.. want to duplicate those nights. We are both side sleepers and are in our mid 50’s. What would u recommend for a mattress for a King bed? I would also be interested in a couple brands of latex mattresses as I am a side sleeper as well. I do sleep on my back some but mostly side. I get a squishing feeling between my hip bone and lower rib when I sleep on my side… I have a Hastens Auroria Medium mattress…. Great info and so helpful! I was so overwhelmed after mattress shopping. I am currently on a luxury plush euro top Sterns & Foster and I can’t take it anymore! The dips in the bed make me feel like I’m sleeping in a canoe and I wake up with the worst aches and pains! I have narrowed my liking down to a hybrid and of course a Tempurpedic but I’m having a hard time reasoning paying over $4,000 for a mattress. Can you please share your thoughts. I really need a good night’s sleep! Thank you! Can you tell me in your opinion couple of the best or most comfortable memory foam or latex mattress set I can buy. I am a side sleeper. I read your above information about side sleepers and it is so helpful. I am confused by so many different brands. If you would send me a few brands you might think are real comfortable I would appreciate it so much. I just need advise on where to get started looking. I have been looking at different types of mattresses and it is so very confusing to know which brands to look at. Thanks so much!